“What is life, what does it mean, and what is our place in it all?” asks Lucas Mix, and has a satisfyingly rigorous stab at answering all three. 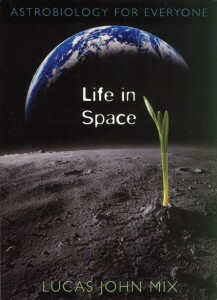 Life in Space offers a very solid review of the diverse range of research fields that constitute modern astrobiology. Mix edited The Astrobiology Primer, version 1 (Astrobiology 6(5), p735-813, 2006) and the experience has clearly given him a very broad appreciation of the various aspects of astrobiology. Indeed, many of the references given in Life in Space are back to this review publication. The book starts by explaining various common definitions of life (including the charmingly-dubbed Pornographic definition, referring to a 1964 court ruling: ‘I know it when I see it’) and its biochemical processes, before moving into the mechanisms of stars and planets needed to support life. We are then lead on a tour of the solar system, discussing the astrobiological potential of each body in turn, before widening the scope even further to review extrasolar planet detection and characterisation. Later chapters return to focus on material introduced earlier, with a history of the terrestrial biosphere and in-depth review of the molecules of life and energy generation. However, perhaps the author, now on his home turf (Mix received his Ph.D. in Biology form Harvard University), lingers a little too long on explaining the minutia of biochemistry and gets bogged down in detail which is not built upon later. Chapter 4 also seemed to jump the tracks slightly with a lengthy discussion on symmetries and the reflection of objects through four dimensions of space and time, which struck me as a wholly laborious way to getting around to explaining life as a local decrease in entropy and the chirality of biomolecules. Of greatest interest in Life in Space, and a feature that really distinguishes it from most other publications on the subject, however, is Mix’s extension into the epistemology of astrobiology and the potential philosophical and religious implications of this research. Such central aspects of the search for life beyond Earth are often carefully skirted-around by authors, apparently so as to avoid the depth of discussion required and potential controversy it may generate. Mix, though, is a priest in the Protestant Episcopal Church and brings his fascinating points of view into the treatment, tackling these important areas of astrobiology head-on. Mix explains how the fact that we have only a single example of life, that being ourselves on planet Earth, necessarily biases our ability to draw generalisations and understand the requirements of and processes involved in potential extraterrestrial life and thus how best to search for it. When trying to formulate what an alien intelligence might be like, its reasoning and intentions, we are fundamentally restricted by the evolutionary idiosyncrasies of our own perception — the three colour channels that we see in, for example. Our own biology (and at higher levels our philosophical or religious beliefs) fundamentally influences our science, a crucial point that is rarely fully appreciated. Life in Space is a broadly-researched introduction to astrobiology, written in a very warm and personal style.